Estimates of economic damage from Hurricane Sandy are now ranging between $30 - $50bn. This is clearly a large number. LA Times: - Estimates of the economic losses caused by Hurricane Sandy earlier this week reached $50 billion as experts assessed the costs of severe property damage, shut-down subways and power outages. 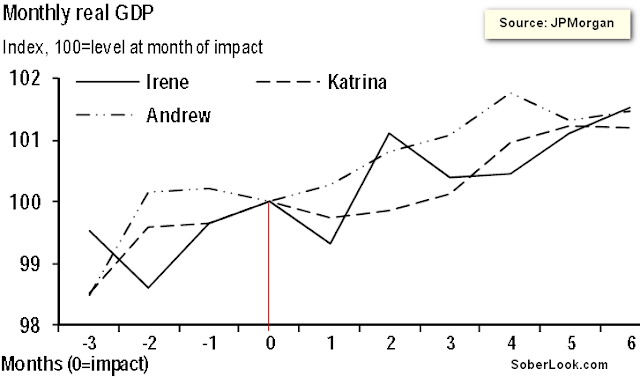 But as terrible as this event was, in terms of economic damage it is still expected to be considerably below that of Katrina, which adjusted for inflation came in at $145 bn. The question now is: what will be Sandy's impact on the US economy? Based on historical experiences, the answer is not entirely obvious. JPMorgan's recent report attempts to answer it. Their view is that "Hurricane Sandy may initially depress economic activity, then support it over time as rebuilding commences". In the near-term the hurricane-impacted high frequency data and seasonal adjustments may be off for a couple of months. Longer term however, the impact on the overall economy should be minimal. The chart below shows the monthly GDP after three major hurricane events. Although we may see some weakness within the first month or two, the economy seems to be stable six months out. 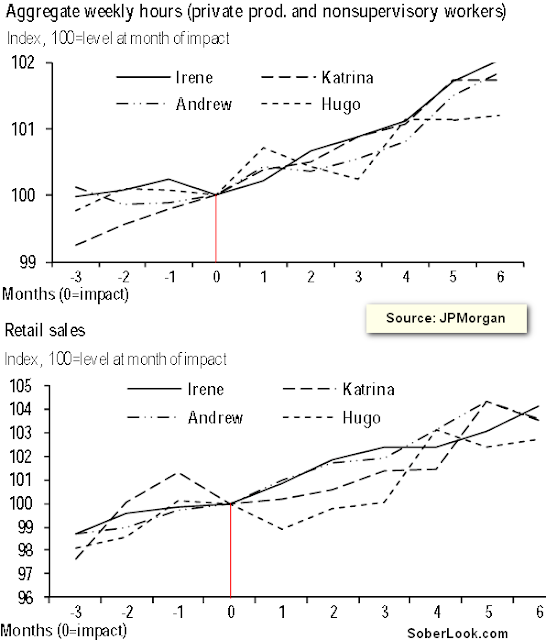 A similar analysis was performed with private sector hours worked as well as retail sales. The results are quite similar, as economic trends seem to pick up a positive trend out to six months from each event. The biggest impact will be on housing, construction, and retail sales (particularly given that unlike during Katrina, major energy infrastructure was not heavily impacted by Sandy). The initial decline in these areas will be followed by a boost in building materials purchases, added construction, and some home sales, as families who lost homes enter the market (although the Northeast typically accounts for a relatively small portion of US housing sales). If historical data is at all representative, by the end of Q1 2013 the US economy should be following the trajectory it would have followed without Sandy - and possibly an even better one.